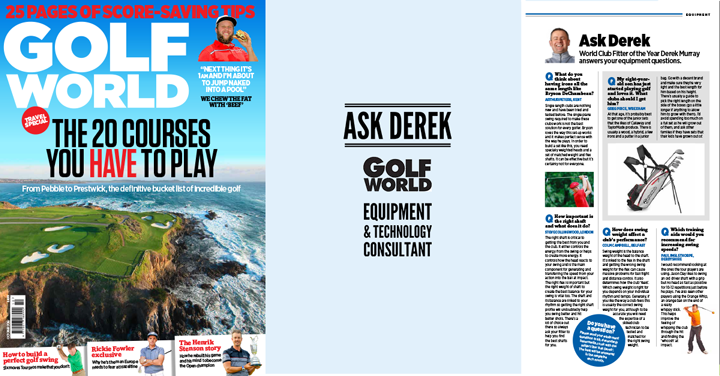 Golf World Magazine wanted their readers to have information that was relevant to them and helped answer their golf equipment questions. Take a look at the latest "Ask Derek" column. Do you have a golf equipment or custom fitting question? Send them to us and the best will be answered in the magazine by @Foregolfcustom. What do you think about having Irons all the same length like Bryson DeChambeau ? How important is the right shaft and what does it do ? How does swing affect a club’s performance ? My 8 year son has just started playing golf and loves it. What clubs should I get him ? Which training aids would you recommend for increasing swing speeds? Killeen Castle Golf Club, Dunsany, Co Meath, Ireland. Thank you for registering for our newsletter! Sign up to get our monthly newsletter and learn more about custom fitting. You will only ever receive our newsletter with information about ForeGolf, custom fitting or the odd customer promotion by email. You can unsubscribe at any time. © 2018 ForeGolf. All rights reserved. Lovely to revisit Christine, Don and Dave for a session after 8 years. New facility is fantastic and Dave's knowledge and relaxed approach is a joy. I was amazed how technology has moved on since my last fitting and am looking forward to the arrival of new woods.This is a very special place, with a super mix of professionalism and warmth of welcome, with absolutely no pressure to buy and a genuine desire to help one's game, whatever the level.I would encourage any golfer to spend an hour here on the bag assessment. I can promise it will be an experience to remember. Had a good day can’t wait to use the new clubs. All the guys at foregolf are so professional if your looking for that tour experience this is the place. From the moment you walk through the door it’s fantastic thanks guys . Another great experience at ForeGolf last week. My second time for a fitting with you guys and I would definately recommend a trip out to you for anyone looking to invest in new clubs. Really interesting to see how clubs have progressed since my last fitting six years ago! Excellent Service. Great fittling session. Having been lucky enough to win the Foregolf competition on Instagram prior to Christmas (their competitions are real) I paid my first visit on 31st January. I was put at ease straight away by Christine with the offer of Tea/Coffee as I waited and Don came out of the workshop for a chat and to explain how the process worked. Just swing as you normally would and we'll fit the Clubs for your swing. Not the other way round.After a few minutes I was brought in to warm up and get loosened up before the fitting began. The first thing that struck me was the surface you were hitting off wasn't just a normal mat but made to feel like you were hitting off grass where you didn't get away with an imperfect contact like you might at a driving range.I was met by Dave then and we discussed what we wanted to get from the fitting which for me was basically a full bag check and see what was on offer. I tried various irons and shaft combinations with varying degrees of success before moving on to the woods. My existing woods were a bit of a mishmash with a rescue which favored going left, a 4 wood which came out of the heel and a driver which spun too much.We eventually settled on the Titleist TS3 driver & 3 wood with a set up to suit me as well as a 19 & 23 degree rescues to bridge the gap from my irons. Dave explained he could improve my irons but with the woods I would have a club in the bag to manage the distances all the way up to driver.I really enjoyed the experience with Dave, he was genuinely interested, explaining plenty to me as we went on. Plenty of variety and easy to see what would suit or not suit the individual. There was no hard sell either on his part trying just to get a sale.All in all an experience that if you are serious about your golf you should look to pay them a visit and check out for yourself what they offer. To Derek and all the gang .. many thanks for a great session on Tues. I had forgotten how much fun it was to be personally fitted for clubs. The technology you have to hand is just amazing and I can’t wait for my new clubs to arrive. Thanks for all your help. Fantastic day yesterday with Fore Golf. Just love their knowledge and interest in getting more for you from your golfgame. Can't wait for my new clubs and extra 50 yards!!!!! You havn't been properly fitted for clubs if you havn't been to Fore Golf. Thanks so much Christine, Don Derek and David! Excellent service from the initial meet and greet to the session with David in the swing room. A truly remarkable experience and wishing all at ForeGolf the very best for the future. Thanks to winning one of ForeGolf's facebook competitions (I didn't believe anybody won these! ), I had the opportunity to make my 4th visit last week for a full bag review. It was perfect timing as I had been thinking about changing my 3 wood and hybrid. From Christine's friendly smile and offer of a cuppa upon arrival, to Don sitting down to chat before the fitting and Derek taking the time to do likewise afterwards and through to the actual fitting with David, I had a brilliant time. David had also done my first fitting back in 2009 and once again it was a fun filled and enjoyable session. He used his expertise along with my feedback and the trackman data to provide me with a variety different club heads and shafts to try out. He has a great knowledge and a very friendly and easy manner as we talked through every option to find the one what suited me best. In the end I have ordered the Titleist TS3 3 and 5 wood and I can't wait to get my hands on them. There was also no pressure to purchase any of the clubs.Thanks again guys and keep up the good work and a brilliant service. Expertise and tour experience built into a friendly family business. Derek and David don’t just measure you up and do a calculation, they look at your swing, your ability, and make a judgement call that, for me, was the right one. Excellent. I visited ForeGolf last January (2018). I was fitted for the full bag. On arrival I was greeted, made at ease & enjoyed a coffee while I hit balls in the bay on my own. By the time Dave came in I had warmed up & got the bad shots out of the system. 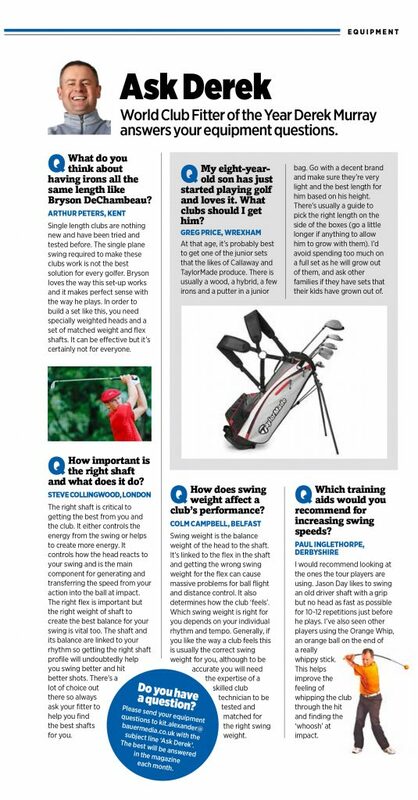 He went through the different club heads & shafts & was very thorough with this. I was not happy with how I hit my driver on the day & thought this would affect the fitting but I don't think it did. I had one driver I felt very happy with & hoped that would be the one Dave recommended. I said nothing & it turned out to be the recommended driver. We looked at the rest of my bag & Dave felt that I was ok with the 3 wood & rescue. He changed the setting n the 3-wood for me. I got my clubs & did not take too long to get used to them. I was part of our Purcell team that lost in the Munster Final & a few weeks later shot -1 off 12. I am currently playing off 9.6. I went back up about a month ago & got fitted for wedges as my gapping was a little off after getting the new irons & as I had got really used to the extra quarter inch on the irons and were not on my old wedges. Again I received the same warm welcome & brought two of my friends from Cork as well up with me for full fittings. I was fitted first & deliberately did not look at any wedge I was hitting to avoid bias (previously used vokeys). I hit one wedge consistently & that was what I was fitted for. It was not a wedge I would have picked (Mizuno) but have been very happy with them so far. While the boys were being fitted Derek answered all our questions, discussed clubs, drew us coffee & gave us range balls to hit while we were waiting. You can get clubs anywhere but you will always wonder should I have different shafts, longer shafts etc. Once you leave ForeGolf you can eliminate all those questions & doubts. You don't want any doubts on the golf course. Thank you ForeGolf. Hi guy, just want to let you know I’m getting on brilliant with my new irons, getting 25/30 yards more with them 🏌️‍♀️⛳️ !! Love them 💕! As for the new driver, I’m hitting the ball straight down the middle. For years I struggled with huge inconsistency in my game across all clubs. A 15 handicapper going in the wrong direction - and fast. Hooks, slices, fat, thin - I had them all in abundance. Following a visit to ForeGolf and taking up their recommendation for a new set of irons, fairway wood, hybrid and driver, over the last few months my ball striking has improved immensely. To the point that I’m now playing the most consistent golf I’ve ever played. And what can I put this down to? The attention to detail in building a set of clubs that maximise the strengths of my swing and minimises the “misses” we all have in our game. I’m much more confident off the tee and also in approach shots - rather then not knowing where the hell the ball was going to go! This can only be done with the correct lie angle, heads correctly weighted, shafts appropriate to swing speed, and all perfectly built to world class standards on site to the right specification. The custom fitting experience at ForeGolf is fantastic - but the medicine needs to be taken. If the recommendation is for a new set do what you can/must to take it on. You don’t have to go the whole set - if that’s the recommendation - start with driver or a hybrid and eventually get your desired outcome. Going to ForeGolf and and not taking onboard the custom built prescription is akin to going to the doctor, getting a prescription for an illness and then going out the door and buying a generic drug over the internet. It may appear to be the same but is it really? Foregolf is a very professionally run family business that makes you feel welcomed the minute you set foot in the door. They cater for all your needs when getting custom fitted and make it a very enjoyable process. Thanks to all involved.. The best fun you can have not under the duvet! Seriously, if you love golf, get yourself here. They are very professional and very friendly. The place is like a Willy Wonka factory for golfers. I learned a lot and I have been a low handicapper for a long time. I am just disappointed with myself I didnt come here sooner. I promised myself if I was playing golf regularly enough that I’d buy new fitted clubs, I had every intention of going to the “high street” shops or a club pro but I heard about Foregolf from a friend, I done some research and decided this is the way to go so I recently got fitted in Foregolf.... and I absolutely loved it!! From the moment I walked in Derek made me feel very welcome and unbelievably at ease... I went for the full bag check and would 100% recommend it, you are under absolutely no obligation to buy when you visit... but of course I did... I went with Mizuno irons and wedges that I couldn’t wait to pick up, I have only played with my new clubs 4 times and have lost a shot already!! I am defo going to get my 3wood and rescue off Foregolf sooner rather than later!! If you love your golf get yourself up here for a bag check, best money I’ve ever spent!! Thanks again Folks... I’ll be seeing you again soon! the guys are excellent. I got fitted recently and they are very professional and friendly..they ensure you get the right fit for you whether you are technical or a feel golfer or a bit of both. my new clubs are sweet and work really well . well worth it whether it's one club or the whole bag .you will notice the difference.they are craftsmen of golf without a doubt. Don't waste your money on off the shelf clubs..
Dave was excellent , very interesting to listen to him throughout the fitting process and explain the mechanics of everything! Very enjoyable . Great welcome by Christine on arrival and she makes the best cup of tea too! Class afternoon start to finish ! Great experience at ForeGolf at their Killeen Castle base. Warm welcome from Christine and a nice chat with Don who took the time to share his knowledge and show me his workshop. A full bag fitting with Dave was time well spent - great insight and understanding and a gent to work with. Have seen the results on the course from the additions to the bag and would highly recommend a visit to see the team. A very professional experience, knew what they were talking about. Answered all my questions. This was the best fun I’ve had hitting golf balls ever. Not just for low handicapped players. I’m an 18 hacker, and it was fantastic. No need to be overawed. The level of technology is awesome but simply explained to an ordinary player. New irons on the way, and I might not stop there. Golf is a hard game, but technology has moved on. Use it, it’s a great help. Many thanks to Don, Dave and Christine for a super experience at ForeGolf! Beautiful facilities and excellent customer care throughout. Right from the minute you walk in the door, the place has a touch of class. I was excited to get there, get warmed up and get fitted but having never been through the fitting process before, there was some apprehension. I need not have worried, Dave has the patience to match the process, countless combinations tried and tested...and amazing knowledge on show, the numbers don't lie to Dave! I couldn't have been happier...hope you had a happy birthday Christine! This was my second time with ForeGolf. I got a full bag last time (7 years ago) when they were working from the tour van. The new set up in Killeen Castle is simply magnificent. I had been there briefly a couple of years ago to have them replace the shaft on a damaged iron (another great reason to have custom clubs made, you can replace or add to the set). It’s hard to describe the customer service you get here. It’s a family run business and you get welcomed like a long lost cousin while being treated absolutely professionally at the same time. I imagine Richard Branson would give them 10/10. Fitting clubs is part art, part science, and a little black magic! If you have ever been fitted by one of the big brands at a club day or in a shop and think you know what it’s all about - you’re dead wrong. This is the real deal - fitting and custom making clubs on steroids. To sort out the driver I hit about 7 different heads with varying combinations of shafts as Dave worked the trackman data and my feed back to find a set up that I was confident with and created a ball flight I liked. Reduced spin, a gentle draw and a consistent 30 yards extra carry was the result 👍. All round just great service from lovely people who know their onions. Just got back fom my second session at ForeGolf> I got a driver and two wedges the first time, which have made real difference, so this time I went to get the lads to look at the rest of the bag. These guys a skilled craftsmen with a real depth of knowledge on the engineering of golf clubs. Derek showed me a pair of fairway woods that I would never have looked at otherwise, and the difference was amazing. Add to that the warm welcome and the commitment to qualtiy and you have a first class service. I couldn't recommend it highly enough. I cannot recommend this place enough!! I drove up from Cork to get fitted for full bag and putter. Was welcomed by Don when I walked in the door and he couldn't have made me feel more relaxed. We got chatting and I instantly knew I made a good choice. His knowledge of the technical side of golf was incredible. I was introduced to Dave shortly after, who done the fitting for me. Again, a very welcoming person and a fountain of knowledge. He answered every question I had and more. The facilities are top notch and the staff will go above and beyond to make you feel welcome and that your golf game is more important to them than getting your money. A truly welcoming and incredible experience. Couldn't be happier with how my day went and I cannot thank the staff enough for making me feel welcome and as comfortable as they did. Thank you! This was my second time to go . This time I got a full set of woods and irons to suit me. My irons are known as a split set as my 5and six are different. My clubs are different makes adapted for me , that’s the reason for going to foregolf. Foregolf never fails to disappoint again I have to say a big thanks to Dave for all his help yesterday. I can’t wait for my new driver to arrive. For anyone thinking of booking a fitting you won't be disappointed.. I'd just like to say what a great experience I had at Foregolf. I went for a full bag check and ended up getting a M3 driver and M4 3 wood. I was fitted by Dave who recommended all my other clubs were fine and did not need changed. There was no pressure to buy and had a great chat with Don before the fitting. Would definitely recommend them. I just wanted to say a great big thanks for the fitting experience I had as a birthday present last month. I was absolutely delighted and blown away by the whole process and the detail that Dave went into with myself and brother. He was very easy to talk to and helped me settle into the process very comfortably. Also to Christine and Don a big thanks for your kind words and chat as we waited and just before we left. I had read many times over about Don’s dedication and knowledge in this industry but to meet the man and have a good humoured chin wag with him was just brilliant!As they say however behind every good man there is a wonderful woman and that’s certainly true of Christine. Ps. I was fitted for a new Cobra F8 driver and M4 irons and received them some 3 weeks later. I have since played a couple of rounds and had a few sessions at the range. First impressions are very positive and they are proving to be every bit worth the trip and money and I’m looking forward to a few months of good weather and some good golf.I thoroughly recommend Foregolf and would encourage anyone to get down to Killeen castle and get a session done!Many thanks and can I take this opportunity to thank all at Foregolf again and wish them all the best for the future and I hope to visit again! I really couldn’t recommend Foregolf highly enough. I went for a full bag check last year and came away with new Driver, 5 wood and irons. Being able to try the different brands was fantastic, we identified what best suited my game very quickly and they recommended what I should get. There was no hard sell, I also hit my 3 wood and wedges and was advised they suited me and no need to change. The customer service from start to finish was exceptional and the clubs have made a massive difference to my game. If anyone is reading this and is on the fence about going for a fitting, I couldn’t recommend it highly enough. Went down last week for a full bag fitting and the experience was exceptional. Dave went through a large number of different types of irons and made the decision easy for me in the end. From the time I arrived till the time I left, everybody was very helpful and I couldn’t recommend the place enough for any golfers looking to improve. Amazing experience from the second I walked in. I was greeted by Christine at reception and even got to chat Don about some of his amazing golfing experiences over the years. Dave was so easy going throughout the fitting session and his wealth of knowledge is quiet staggering. The facilities are second to none. I could of stayed there all day !!! Really enjoyable experience and it is easy to see how ForeGolf has become so successful. Always great to hear an Irish family run business doing well and at the forefront. Can’t wait get my hands on my new irons. Thanks again Derek, Dave, Don and Christine ! Fantastic service from a brilliant group of people. A trip all golfers should be making for the experience alone. Thanks! I really enjoyed my experience at foregolf where I finally enjoyed the sensation of getting a fairway wood airborne with intent! i can't wait to receive both new driver and 3 wood in the coming weeks for the start of the season. Super service received at ForeGolf and a visible improvement on the day. Looking forward to my new kit arriving. Didn’t really know what to expect but really enjoyed trying the different clubs and learning where different elements can improve my game. Looking forward to the arrival of my new clubs now! My trips to ForeGolf are always fantastic. I was with them last year and got fitted for a driver and faraway wood. I went back again this week to get fitted for irons. The entire experience is well worth the money and the change that the fitting has made in my golf game is noticeable. You are always greeted with a smile and the service you receive in the fitting room is second to none. I would highly recommend anyone to go and see them. Decided to go back playing golf about 18 months ago after a 10 yr break and started off buying clubs i liked the look of and ones i read about that might suit me. Gathered up a decent bit of gear that i liked and sometimes worked but eventually decided to go to Foregolf to get properlyfit/looked at and see what they thought. Surprised was an understatement.Probably the best experience ive had in golf overall. I like the science involved in clubs and gear nowadays than was there before and the knowledge i gained from the fitting was unbelievable. The honesty and lack of selling surprises me still, as i know this is a business and the mantra of a business, is to make money. David showed me the difference in what i thought i knew, to what works and then put it into practice in fitting me for irons that gained me 40yrds�7 iron old- 165ish, 7 Iron new,205ish.Iron fitting sorted and we moved to hybrids and after a few hits, he said he couldn’t better what i had. That was a shock as you expect they will try sell.3 wood was ok but pulling right so instead of trying to sell a new one, he changed the setting and head weight and never hit it as well. Driver was much the same & did show a chance of 15% improvement but weighed up the financial cost to an extra 35ish yrds wouldn’t mean much to spend big bucks unnecessarily. Overall im looking so forward to the season ahead for a few reasons.Confidence in clubs eventually.More room in the shed & utility room.A less nagging wife because ive less clubs lying around everywhere��If you’re interested in improving, book in. Lived up to its reputation. Very welcoming staff, and first class facilities and fitting process. Ok so finally got back to ForeGolf yesterday for my long awaited driver fitting after my last visit. Last time as below I wasnt able to get fitted because as I like to say, I was rubbish, numbers didnt add up. So went and got a few lessons with Rebecca Codd and Tadgh Harrington (Harrington Golf Academy) and with Kevin Foy (PGA Pro Stepaside Driving Range). This did the trick. Spin Rate was less than half what it was before, still have a few timing issues but all in all really happy, we were able to get fitted. Just like the last time met the famous Dom for the customary pre fit chin wag and look around the custom fit workshop, and as always left with a lot more worldly knowledge. Then into Dave for the fitting, I would highly recommend anyone getting fitted in foregolf to go to Dave. He is able to explain every part of the process easily and is a really easy guy to get on with. Mind you I have never been to anyone else for fitting there . If you havent bee to ForeGolf, GET THERE. Amazing and well worth the extra few bob to get fitted there. I will be back soon enough for woods fitting. Cheers GuysSo finally went to foregolf for a driver fitting recently after hearing a lot of great reviews . Well mine will be no different . Met don and had a great chin wag . Showed me all the different things they can do with clubs. WOW didnt even know half it was possible . Thanks don . So went into dave for driver fitting and dave came to the conclusion that he wouldnt sell me a driver because my swing wasnt at the stage were a new driver could do anything for me !!! I was SHOCKED with the honesty in a good way . If i had gone anywhere else i would of walked out paying 300 - 700€ for a driver i wasnt ready for . So i have booked back in for the end of march after tadhg and rebecca @ harrington golf academy sort out my swing . Dave thats the best service and piece of advice i ever got . Not only were you honest but you also even took the extra time to give me some pointers . Its just a shame i got new irons fitted elsewhere last year because i would love to get fitted for those from you guys. Really looking forward to coming down to foregolf in march for the second go and seeing how much those numbers change . I will be sending all my friends to you in the future . Great setup and top team . I've dreamt of a trip to ForeGolf with a few years now. I got the opportunity (thanks to a Christmas/Birthday present combo) and every expectation was blown out of the water. The facility is second to none. I was being fit for a putter, however I will be going back once my irons need upgrading as the range of specifications and build quality is truly awe inspiring. Having a massive interest in the technology behind the products themselves I could only describe the whole process as dreamland. I had a great conversation about all things golf with Derek beforehand and my putter fitting with Dave on Trackman 4 was massively insightful into the advantages and spec differences between each model I tried and all explained simply and effectively. Forget the high street golf shops, if your serious about your game then get your clubs built at ForeGolf you'll never look back and you will be a better golfer. I got the full bag custom fit done with Dave. Worth every penny. Hard to believe the difference that the correct equipment can make to your ball striking and flight. Very good experience they made it very personable and all about your own game and how you could improve. They were able to find me an extra 45 yards off the tee. Highly recommend going to see these guys. Have been visiting Foregolf since 2008 , and made my most recent trip last week. Each visit brings more insight into ones game, is always instructive on the industry and the patience of the Foregolf team to find the right solutions only fuels the desire to play more, get better and see where one can take ones game. Is definitely worth making the trip to Killeen. Top class facility, fantastic customer service and professionalism. A truly world class service from a team who are obviously the very best at what they do. It’s not hard to see why ForeGolf are so busy with such expertise available to all levels of golfers. It would be easy to think this service is for only the best golfers out there but it’s for everyone. It’s surprising weal you’ll learn and get from it. Pay a visit, give it a go - you won’t regret it. It's worth repeating that these guys treat every customer like their biggest customer, from booking to fitting to delivery. Such class, expertise and never rushed. Always easy to leave a review. Brilliant experience. Learned a lot about my swing and got fitted for new 3 wood which is my best club in the bag. The team were so helpful. Well worth a visit if your looking to improve your game. Superb set up I could have spent all day there. All the staff are friendly, helpful and very knowledgeable. With the latest version of Trackman giving you a whole host of stats it really opened my eyes as to how much of a difference the correct set up can make to your game. Whether you are in the market for new clubs or just want the lowdown on what you are currently playing I would highly recommend a visit. I have had custom fit at high street stores in previous years but this is on another plant. Great Expierence all in all. Got fully fitted out and went back for seconds. My handicap went from 18 to 10 in the space of 18 months. Mind you it's heading back up but I blame that in the kids.� thanks to all the team. Got fitted for a full set of irons and wedges. Brilliant experience and worth every cent. Would absolutely recommend the custom fitting service at Foregolf . What a great experience with Foregolf thanks to Don and all the gang. I know how the well looked after the Pros are after visiting Foregolf....well without the massage...maybe next year Don.!!!! I strongly recommend all handicaps to go to Foregolf and experience the difference....your game will change overnight...was 12 h/c now 8. Foregolf made the difference....Thanks guys. Foregolf staff are 'Excellent' Very competent group! Have had a couple of custom fittings here, service is second to none. Their attention to detail is excellent. 1st fitting work a treat, the second time I wasn't hitting the ball consistently enough to get an accurate fit. As explained by the member of staff, he could give me something but he would rather I came back and got re-fit when I was hitting the ball more solid. This just shows the emphasis on customer satisfaction and providing the best service possible. Highly recommend to anybody who seriously wants to improve their game. Top people, top experience, top top product. Been to see the team to sort out my wedges and putter couldn't be happier. Lost 4 shots off the handicapBe in to see you guys over the winter for a look at the long side next! I have been to ForeGolf on several occasions - dating back to when they operated out of the back of a truck in a driving range. Always a great experience. So great to be able to try and club make and model and work with the guys to get the best shaft/loft combinations to suit your game. Would not hesitate to go back there again for next club purchase. Great place to improve your game. They can fit you clubs so your games gets better in parts you didn't even know you could improve. I can highly recommend visiting Fore Golf and get some new clubs to make golf more fun. Went for a club fitting last week must say how pleased I was with the experience! The moment you walk in the door to finished hitting balls! Staff were super! Really enjoyed my visit to ForeGolf. I have been looking to change my driver. I have now been custom fitted for a driver which will suit me personally. Can't wait to get it. The experience was great. David took time to explain how it works and answered questions. Interesting to see my shots on the screen showing distance etc. All in all a great experience and would recommend it to everyone. The venue itself is fabulous. i cannot commend the team at Foregolf enough for their kind and professional approach to my fitting sessions. Christine was welcoming and reassuring in equal measure. David fitted me with a driver that has both cured a perennial slice and added yards to my distance off the tee and, more importantly, provided me confidence on the tee. He also provided me with a fairway wood that is both accurate and long. For the first time in 30 years I have clubs that actually work for me. Such is my delight that I have decided to replace my other fairway wood with another Foregolf hand built special. Well done indeed. Great experience! Derek and all the team make you feel so welcome. Very informative session and really enjoyed learning how they make the fitting decision. Really happy with what they suggested for me. Would highly recommend to any golfer, beginner or pro! Very experienced fitters and friendly service. This was my second visit to foregolf. I really enjoyed the experience. After a full fit my irons required no change after my first visit 5 years ago. I received great feedback and advice from David on my woods and driver. I would recommend using foregolf as the team make every effort to assist you with improving your golf game as well as making it an enjoyable experience. I went up to Foregolf in killeen castle yesterday for a full custom fit and it was a brilliant experience. I drove a 5 hour round trip and was very much impressed with the professional set up there. From the moment you walk in the door you are made welcome and given real attention. Don and Derek had just flown in earlier that morning from Mizuno HQ in Japan .I was greeted with a complimentary coffee by Christine and then given a basket of range balls to warm up at the drIving range. David Williams did the custom fit and he was so professional. The golf balls are proper taylormade range balls and you are hitting out into a driving range so you can see for yourself the actual ball flight. They use Trackman and there is no hard sell, if they can't out perform your existing clubs then they don't push a sale on you. They don't rush you during the custom fit so you will leave happy. I changed my irons and woods and they threw in a few extra goodies, as well as a free game in Killeen castle golf .Put this place on your Bucket List. , a definate must. Really enjoyed my experience. Very efficient, friendly, and successful trip. Looking forward to using my new club. Tks Dave and all the staff. I went to foregolf on Monday,I have to admit I was a bit anxious going but once I arrived i was put at ease.I was offered a cup of T/C and sat down relaxed for a few minutes before went up to driving range to warm up.Im very new to golf and my ball striking wasn't great to start but David's patience was great as eventually got a few good swings flowing.He was able to tell me that my driver was to long and heavy so he has giving me a lighter shaft and a better head to get me on the right direction. Definitely will go back again once my game improves.Thanks for all the help David and team. Third visit and every bit as good as the first two. Firstly, if what you have works, these guys will tell you - there's no danger that they'll suggest you need new clubs or shafts if they don't believe it. But when they do see that what you're using isn't right for you, they're simply brilliant. The whole experience from beginning to end is top class. They'll tinker with shafts, lofts and lies to see if there's anything can make even a little further improvement and settle on what works. And the results are right there in front of you - Trackman shows you all the stats but the ball sailing out over the range right in front of your eyes tells you more than stats will. Can't recommend ForeGolf highly enough. I had a lovely surprise of a gift to experience a custom fitting with Foregolf .I am a 25 handicapper and truth be told I was nervous as I heard so much good things about the team and what they do at Foregolf. I was so so impressed as Dave Williams and the team explained the custom fitting process in a user freindly way whereby I felt a big part of the decision making and no pressure was ever placed on me to fulfil a order .I can safely say I felt like a professional golfer for that one hour and a bit .My wife Annette whom does not play golf was well looked after by Christine in the office with a lovely cup of coffee and walked the grounds of Kileen Castle .I cannot wait to get my new custom fit clubs and to begin taking a few shots off my handicap with a few wins as a bonus along the way.Thank you to Dave and the team for a great custom club fitting and I look forward to reading about your many successes this year and into the future. For me the best experience I've had in any fitting and certainly wont be going anywhere else again in the future! Went for a full bag check with my relatively new irons & Driver which were fitted elsewhere. Always felt the lies were not quite right for me and this was spotted straight away. They were a mile off! During the session my own 7iron had the lie adjusted and there was an instant improvement in consistency and grouping of shots. Again with the driver, went through a few different options and was advised that a draw biased version of my own driver was the best option and told that I'd be best getting a second hand version with my own shaft which is exactly what I did. Also got the lies adjusted on my irons at foregolf and what a difference it's made! Came 2nd in the first two competitions since these changes! Cannot recommend foregolf enough and I certainly know where I'll be going the next time around! I got a voucher for a full bag fitting and didn't really know what to expect when I booked in. As soon as I walked through the door, there was a great vibe. Christine checked me in and made me a coffee while I waited. She is so nice. Then Don who makes all the clubs came out to me for a chat and his enthusiasm for what he did was great. David then brought me out to hit a few balls and went through all the aspects of the swing. The great thing is, the find out what club suits you. I tried a lot of clubs and I can tell you my golf is not good so he had his work cut out for him. He was very friendly, so knowledgeable and just an all round gent. He found the right clubs for me and gave me the price. There was no pressure to but them and you can buy one at a time if you want. I did buy a new driver. I would recommend this to anyone and everyone. A special family run business with the customer at the heart of it. This was my second visit to ForeGolf and once again I had an absolute ball. I had a full bag fitting and the going in I had a gap in my existing bag between 4 iron and 5 wood (couldn't trust my hybrid). In relation to the hybrid David advised not getting another hybrid and given the new irons, there would be no gap. So, if people are thinking you'll be 'sold' a load of kit, I was advised not to buy the hybrid. The iron fitting was great fun. Seeing the results on the screen was fantastic. Each club hit has it's own colour and is circled for dispersion. I hit with 6-7 different irons in total. If you are into your gadgets and tech David explains what changes he is making with each shaft and club head in terms of weight, flex, etc. The result for me was not massive increase in distance, but actually a much tighter clustering. The driver fitting was interesting. I currently don't hit my driver and I'm confident and getting decent distance from my 3 wood. But I should be able to find a driver that I can trust and am confident with. The numbers said that while I did find one, there was no noticeable distance gain (9 yards). The advice was that until I update my swing, spending money on a driver was not necessary. The combination of expertise is all clubs, plus a willingness to discuss your game mean I certainly don't feel like kit is being pushed on me. All of the staff are amazing and I can't wait to pick up my clubs in a couple of weeks. Roll on the 2017 season. Thanks to everyone in ForeGolf. Would highly recommend a trip to foregolf, being reasonably new to the game and starting to play a bit more regularly i decided the 20 years old irons had to go. The fitting was very enjoyable and more importantly informative. Dave was patient and gave a few great swings tips too, he went through a lot of shafts and heads until getting the right fit. There was no hard sell and he advised current driver and woods (all of which were pretty new) were a good fit already so to focus on the irons. Collected my taylormade PSIs on Friday last, played twice at weekend and although still early i am getting more distance, control and accuracy... pity about my putting ;-) ... thanks lads. Paid a visit last week to Foregolf for a fitting and enjoyed the experience thoroughly. Dave explained precisely what was happening in what is a very technical exercise. It was amazing to see how he "fixed" my terrible swings to bring about a desired result by making various adjustments to the clubs we tested!!! I look forward to using the finished product. Thank you so much to David, don and their team yesterday at foregolf. Made the trip up from Limerick and it was a super and fascinating experience. Would highly recommend the experience to those trying to fine tune their game, looking forward to my new clubs! Thanks again! Got fitted yesterday. from the moment you enter the door the friendly atmosphere is unbelievable. was greeted at reception by Christine- a very pleasant down to earth and easy on the eye lady. sat down and was looking at Don inside his bat-cave making clubs. moments later after seeing the expressions on my face in regards to the technology he introduced himself. he invited me inside the workshop to have a look at the equipment in which he uses to make clubs for any individual, any handicap, any level and any requests. highly impressive workshop with 1000's of shafts, heads, grips and basically can make any club from scratch designed for YOU!! Moments later I was greeted by Dave. He's a fitter and worked as so on the PGA for 8years. into the driving bay I went and hundreds of drivers, wedges, irons and putters. looked at my mizuno's and had me hit a few 7i's with tape across the face to show impact. after hitting a few he started handing me various irons to gradually eliminate which would or wouldn't work for my game. I could see by ball flight and feel what was working for me so after going back and forward a few times this particular shaft and club head combination was suiting me perfectly! exact same was done for my driver. by 50mins or so I now had irons and driver which felt identical and loaded the exact same. I also had specific requests from 8i to sandwedge and from 5i to 7i which will be build as per my request. honestly these people can do anything to a golf club in their workshop. you want a specific shaft no prob, a specific head no prob or a specific swing weight no problem. I cannot stress enough how important it is to get golf clubs fitted but fitted properly. you wouldn't buy a suit from a shop without getting some sort of alternations to address height etc unless it was specifically designed for YOU! exact same for golf clubs. overall delighted with the fitting and experience. Awesome experience. Left the fitting bay with a clearer understanding of why my clubs were not right for me can't wait for my new sticks. A big thank you to the whole team at Foregolf. Up until the middle of this season I have slipped to a handicap of 13.4. The problem was off the tee box i was losing a lot of shots right. Its a funny game as all of us know and tiny nuances make the difference. I had generally always hit a power fade or a draw if I needed with the aid of set up. These all of a sudden seemed to have abandoned me. So I booked a time with the guys and saw Derek in july. Straight away he identified the problem and gave me sound advice. We decided that because of my swing improvement lessons and my swing faults ,or call them what you will, that a club with strong adjust-ability and a forgiving but not overly so face was for me. Actually i tried 5 drivers with multiple set ups and shafts. I chose the Big bertha. Initially I struggled with the club but now its like poetry. I am down to 9.9 and am over delighted. I can just aim up the right side of the fairway and blast it. Single figures soon is the goal and I am sure its achievable. a huge thanks to Derek and the Foregolf team.The key to it is that I feel I have something I can really work with and you simply cannot achieve that with an off the rack Driver. Yesterday, I had my fourth visit to ForeGolf. You see, I recognise quality and efficiency and I have benefitted hugely from customised club fitting.The attention to detail is what separates this company from all the rest and the guys at ForeGolf will NOT push any particular club brand on you,but will build clubs around you,the person, and your particular swing etc. I will always recommend them to anyone who is thinking of changing their clubs, because as they say in their logo "Building Better Golfers"
Went to Foregolf at the end of may. It was a great experience. Great facilities and insight. Got my clubs 3 weeks after and delighted with them. Got fitted for an M1 driver with Derek in Killeen about a month ago. I have been hitting it very well ever since and last week I got my breakthrough win by winning the North of Ireland in Portrush Golf Club. I am very grateful to Derek and I would highly recommend getting fitted with him. Excellent and friendly service, should have done it years ago !Can't blame the clubs now..PS..thanks for the cool hat ! Went for full back check and was very pleased with the professional service. Was made very welcome on arrival and the fitting was extremely beneficial! Will be back in the future for sure! Went to Foregolf for a full bag check. It was good craic and very professional I booked in for 1 hour session a hour and a half later I was still smashing balls!! No hard sell whatsoever!! Dave said I was flushing my irons as good as anyone on tour and there was no need to change them. I ended up with two new shafts one for my 3 wood and one for my rescue. Am now hitting them as pure as driven snow. I also got fitted for a new putter, am now draining putts from everywhere. Dave also recommended the taylormade m1 driver as it had a lower spin rate. However when it got it I was wasn't hitting it as well as my old driver. Went back down to Foregolf they got me to hit balls with both drivers crunched the numbers and agreed I wasn't hitting it as good. Talk about great customer service full refund no questions asked. I cant rate these guys highly enough. If you seriously want to improve your game get booked in to Foregolf. Tell them Wee Dave sent ya!!! I visited Foregolf as a birthday gift yesterday and was very impressed. Plenty of smiles and good facilities as soon as you arrive. Then down to business in the club room for the fitting. Derek was very professional and personal. He gave sound advice with details on the numbers, all of which meant that I felt very at ease and confident in what I was being advised.Went through a range of clubs and shafts and settled on a driver/shaft combo that I was happy with. I can't wait to take it out on the course.Overall a great experience that lived up to my high expectations. Highly recommended. I wanted to thank all the staff at ForeGolf for the excellent service I received. .Derek took time to introduce himself and explain how the process worked. He gave me great confidence that their individually custom fitted clubs could improve my game. Dave did the fitting session. I was highly impressed by his depth of knowledge and he took time to explain the different clubs and shaft types I tried. I could see on the computer screen that I was hitting much straighter and longer shots with the clubs he recommended. I have ordered a set of irons,recovery club and a fairway wood. Dave also adjusted my driver which will hopefully result in more consistent shots. With Derek and Dave I knew I was in the hands of experts. I can't wait to try out my new clubs on the course! After my experience I could not recommend ForeGolf highly enough and would encourage anyone who is hoping to improve their game with the best possible equipment to book an appointment. I would highly reccomend the experience. I spent a very enjoyable hour with your courteous and helpful staff. Can't wait to collect my new driver and see the difference it makes on the course. How do you know you have the right clubs in you hand?Thankfully I discovered I had not after I got my new clubs front Foretold. They feel so natural to my swing plane and the ball flight with each club is a pleasure to watch. More than glad I went up to Foretold in Killen Castle. Thnaks agin Guys. I cannot recommend the custom fitting services at foregolf enough. Fantastic customer service throughout. Friendly and welcoming atmosphere. Custom set of irons have made a huge difference to my game, my swing has improved and my scores as a result. Huge thanks to Derek, Don and Christine.Will be back for more! Great experience last Wednesday with Derek and David. David explained the rationale of the different shafts with the various iron and driver heads and the improvements were easily felt and proven with the data. Thanks lads. Wasn't sure what to expect but was warmly welcomed by Derek on arrival. Hit a few balls at the on sight range to loosen up and then had a cuppa while waiting on my fitting. David took me for the actual fitting and was extremely knowledgeable and friendly. He explained everything to a point where even I understood why he was changing a certain setting. This is not a hard sell exercise but truly an experience in getting better. David took me through my bag and left well alone anything that was already working for me. He then worked on strike, control and dispersion. All of which were greatly improved with every adjustment. It's an experience I really enjoyed and would highly recommend it to anyone wanting to improve any part of their game. Now looking forward to getting my new clubs and some better weather! I visited ForeGolf and Derek with Seamus Power last week. I have to say it was pretty impressive. The knowledge Derek has regarding golf equipment and a proper fitting is fantastic. Also, the enthusiasm he brings to the table is like nothing I've seen before. I look forward to the next time I see Derek and the rest of the ForeGolf family! Spent a couple of hours with Derek and Fore Golf again today and as always first class service. For 15 years now I have worked with Derek and I have never met anymore more knowledgeable in the field. Anyone trying to improve their game should call and book an appointment with Fore Golf as soon as they get a chance! Big thanks to the lads at Foregolf for all the help over the years. I have been going to foregolf for 14 years now and they are the best around at fitting and building clubs. The facilitites at Killeeb Castle are first class. It provides great peace of mind knowing that my equipment is built correctly and exactly suited to me. Thanks again. I really enjoyed my fitting session in ForeGolf and I regret not going sooner! The entire team made the experience a real pleasure and it was a real treat to have someone of David's experience point out the good parts in my game and show me where I could benefit from a club setup based on my swing and my needs! I would highly recommend a visit to ForeGolf to anyone seeking to improve their game - not just the pros! Just had my fitting session with Dave. Best hour I've ever spent hitting balls and am delighted I did it. The ball flight speaks for itself and the numbers don't lie! Highly recommend to anyone. Customer service top class throughout. Thanks lads, Andrew. Wouldn't buy my clubs anywhere else...5 stars is not enough to rate Derek and Co.
Larry Doyle hereI picked up my new clubs from Fore Golf 2 months ago, played my first full 4 games in Spain last week. Was on the winning team in 3 out of 4 competitions ( first time in years) need i say more.The clubs have made a massive difference in length and direction.Go to Fore Golf and treat yourself. Beyond excellent! My first experience at Foregolf was five years ago when they were in based in Naas. That day changed my outlook on golf. Derek and the team have helped me get my game to a stage I'd never previously could have hoped possible. Building better golfers is what they do, but it's the way they do it that's truly remarkable. To have that level of personal attention from time in the club room, to having clubs hand built with a level of skill and attention to detail that tour players enjoy, is just incredible. You just couldn't hope to meet a nicer group of people who deliver a standard of personal service that is way way beyond 5* Over five years I've returned many times to upgrade clubs, re griping and to ask for help. Nothing is ever too much trouble. Phoned late on a Friday asking for advice on a pitching wedge that i'd worn out, no problem- even though it's an old model- phone calls made to Titleist and a week later a new hand built club was delivered. Every time I walk through the door to seek advice from these wonderful people, I still have the same feeling I got 5 years ago- they want to make me a better golfer. Foregolf have won European and world club making awards for good reason, they are the best in the business. I can't thank them enough for everything that they done for me in the the last 5 years, my only regret is I didn't discover them sooner. What to be a better golfer? look no further, you'll have so much fun along the way. The visit to fore golf was a first class experience. You get a real sense of knowledge, competence and quality. There is no sales push just a desire to make you better. What I got mostly was the removal of doubt. Once you know the clubs are for you then you don't worry about the club, just on making your shot and knowing it's up to you alone. Really enjoyed the experience. Hope to return too once the piggy bank gives approval. Handicap dropped by 4 shots in 3 weeks after receiving my Foregolf built clubs. Excellent, friendly service. Got fitted for new irons and wedges last november. top class service with no pressure to buy.really hitting my new irons great had 3 birdies last saturday.first time ever .4th birdie putt lipped out overall am very happy to have being fitted. Got a full bag off fore sticks now, Callaway irons and driver, vokey wedges and a taylormade 3 wood, in my first season lost a full 4 shots and now off 4, have so much more confidence standing over the ball, the biggest thing for me is how much better the flight is on all my shots, I also feel that even my bad sots are not as bad! and everything is much straighter...all in all a great experience form day one with foregolf. Current bag is in tatters so they could do with a new home! To anyone serious about their golf, I cannot recommend ForeGolf enough. The attention to detail and service is exceptional. Furthermore the whole team is so nice and friendly.The difference my clubs have made to my golf this summer was incredible. I've never been so consistent and also so confident.I've been 'custom fit' before at demo days with launch monitors and to anyone that thinks that's custom fitting, you have got to head to foregolf to see the difference. It turned out my 'custom fit' driver was completely wrong for me, so they fitted me with a new shaft and it's worked wonders.I'll be only getting custom fit clubs from now on. No way would I buy off the shelf now I have experienced the difference. No matter what your handicap, no matter what your ability, head to foregolf and you won't be disappointed. I have been a client of Fore Golf for 20 years ! I am now being fitted for my 3rd set of clubs ! Their new set-up is fantastic-- it has the wow factor -- all open plan - friendly - with everything in the workshop on display & Don & Aaron working live !Fore Golf are a very professional,helpful & friendly team with meticulous attention to detail.I recommend them to all aspiring serious golfers ! Just wanted to share my experience at Fore Golf. Went up last year and got fitted for new Driver & Irons it was the best decision I ever made. When I arrived I was greeted by David Williams who sat me down and went through everything I would be doing that day & introduced me to the club fitters Don & Aaron, from there I went into the fitting room where all the magic happens. David spent time with me during my fitting explaining different shafts, heads & showing me on the screen what my ball flight was doing also club at impact and anything else I wanted to know. The whole process made me feel like a pro getting fitted. I have played many rounds in the short time I have my clubs and have got my handicap down. I would highly recommend Fore Golf to anyone who is serious about getting the best out of their game & it is true what they say " Fore Golf building better golfers ". I'd like to say a big thanks to Derek, David, Don & Aaron and all the team at Fore Golf for the excellent service they provide. All the best for the future. What can i say about foregolf that has not been said already , the welcome is like walking into a 5 star hotel,the service is better than a 5 star hotel , the workshop is mind blowing , Don and Aaron are masters at work i would stay and watch them all day , then the club room is like a candy shop for kids , thats when the fun begins. Derek and Dave have a gift that if you have not experienced yet , well your missing out big time ! if golf is your thing then foregolf clubs are a must !!!!! I would highly recommend ForeGolf for custom fitting. From my experience of having been fitted for a new driver taking all my stats and ball striking into account, I was fitted professionally with a club head and shaft which suited my swing and greatly improved my accuracy and distance. Dave was precise and informative and knew straight away which club suited my swing. Well worth the long trip and many thanks to Derek, Dave and all the staff at ForeGolf for their help. This was a great experience from start to finish. The key thing for me was that it soon became clear that the focus of ForeGolf is to deliver optimum performance for the individual, above any commercial considerations. In my case I arrived with preconceptions of the clubs I'd like to buy, however ForeGolf readily proved which clubs were best for my swing. They even established that one of my existing clubs was 'perfect' for me and there would be no point in buying a replacement. This just emphasised to me how much they wanted what was right for me. Other reviewers have said it too, I would never buy a club off the shelf again. Thanks to Derek, David & team. As usual it was an absolute pleasure to deal with the whole team! Such a comfortable atmosphere as soon as you step foot in the door. Great to sit back and relax before the fitting watching Don do his thing in the workshop; master at work! The fitting with Dave was fun as always. I hit the balls and he crunches the data. The guy knows his stuff! Thanks also to the very welcoming Christine and to Derek who popped out to say hi. The best of luck to this team for the future. I wish you continued success. This was my second time going for a full fitting through the bag @ Foregolf. Again I was with David and it was a pleasure from start to finish. Apart from the attention to detail and the whole set up in Killeen, I love the fact that there is no hard sell. They don't seek to have you walking away with 14 shiny new clubs even if you don't need them. While I replaced my irons (after 7 years it was time), my hybrids and woods were 4-5 years old and, I was told, still as good as any technology that has appeared on the market since. After testing various drivers and hybrids, with no discernible difference, David's advice was pretty much "leave well enough alone", and so I will continue to play the current clubs for a while longer. Putting the customer first, can't recommend enough. Had my new irons 10 days after fitting too! It is so rare in this day and age to find an operation as warm and friendly, professional and informative and an experience that gave me so much more than I could ever have anticipated. As a woman golfer especially, I would highly recommend a fitting. I felt complete confidence in Dave's assessment and advice and there was no feeling that there was any angle in trying to sell you something that you know you did not need. I have played golf for 38 years with any old selection of clubs but I am now looking at a whole new golfing experience with a magnificent set of clubs made especially for me by the maesto club maker Don. Thank you Foregolf, for the privilege of your time and efforts. I have to say why i did not do this years ago I do not know from the time I arrived and was introduced to the owner Don and offered a nice cold bottle of mineral water then some balls to warm up before I was introduced to Dave the guru for the fitting, He was unreal he did not try to sell me a new driver but said i just required a new shaft to suit my swing and after trying a few different shafts i was delighted with the results amazing experience and would recommend any golfer regardless of handicap to go to FORE GOLF and let them assess you brilliant Thank You again Don,Dave and your wonderful staff. The facilities at Foregolf are top notch. I had a great experience getting fit for a new driver. Amazing the difference in performance between my current driver and the custom built new one I tested. Thanks Dave! A very scientific and logical way of fitting people to the correct golf clubs, but done in such a simplified manner. Full bag kitted out (cannot wait to get hitting them). Lovely people and excellent faculties. Highly recommend anyone thinking of getting new clubs, to book a fitting with ForeGolf. Having been initially sceptical about the process, I am an absolute convert! Dave was very knowledgeable and patient and through detailed analysis was able to design a set of clubs that would work with my limited abilities. The driver and putter were both particularly impressive and should transform my scoring ability. Thanks! Superb Customer Service I have dealt with Foregolf for a number of years now and have never been disappointed. Its a family business where customer service comes first. They have huge expertise and experience and are able to help golfers of all levels. I had my club fitting 18 months ago with David at ForeGolf. I should have gone earlier. Best move I ever made for my game. My ForeGolf clubs have assisted me greatly in enjoying my gold rounds and scoring better on the card than before. I would highly recommend a visit for assessment and club fitting. The benefits far outweigh the costs. You won't look back. Absolutely great experience from start to finish. I am confident my handicap is going to fall now after my fitting and receiving my new clubs. Thanks again for everything ?. I recently had a full bag fitting at Four Golf. A great experience. My main area of interest was the Irons, mine could go any distance from too short to too long with lots of misses to the left. The strike pattern could be anywhere on the face, from heel to toe. I thought this was my swing. After giving a bit of my background and history of various clubs I have owned and hitting balls, David nodded and started selecting a shaft / head combination that he felt would solve the problem. The first ball I hit went right where I aimed it, and so did the next 5. The strike pattern was all on the centre of the club (remember my swing is still the same). The distance was consistent too. Who would have thought changing a shaft would have that effect. Changing the heads was the icing on the cake.My woods were generally OK, but he fine-tuned the settings to give a better ball flight and straighter. Great overall experience. They guys really know their stuff and the facilities are excellent. Dave quickly zoned in on required shaft and once I started hitting that my accuracy was much improved. Reasonably priced for the service you get. Really helpful. Very positive experience. Have got clubs through ForeGolf previously and this is the second time for me to visit. Like that this visit used my history as a baseline and we went from there. Highly recommend ForeGolf to get fitted for your clubs. Very good experience. Had a complete iron & driver fitting with David. He really knows his stuff & though the time went well over an hour, there was no rushing to get the session finished. We went through lots of head & shaft options & worked out final products. Custom fitting is a very exacting process & the people at ForeGolf have it down to a fine art. Thumbs up !! Foregolf has completely changed my game. I suffered badly for years getting off the tee due to a bad slice. I went for multiple lessons but a couple of minutes with Derek and his genius and I was sorted. Can't recommend Derek and the team enough, great people who know exactly what a golfer needs. Will not be getting clubs anywhere else from now on!! If ever a 5 star rating was deserved, it is for ForeGolf. They were recommended by a work colleague who was glowing in his praise for the whole experience. Ultimately, his game has improved and he enjoys golf so much more. They were so welcoming and friendly which made the session so enjoyable. There was no hard sell, nice touch, but rather a desire to help you understand what was possible with the right clubs. Many thanks to the whole ForeGolf team. Fantastic experience at ForeGolf! Derek & Dave both experts at what they do and make you feel at ease straight away. The facility is top class, and the selection of clubs is never ending. The lads keep going until you have the perfect club for your swing, and golf course conditions. Amazing attention to detail also. Couldn't recommend it highly enough. I had only heard good things about ForeGolf and they lived up to their reputation. Very welcoming team. Excellent workshop and facilities. Enjoyed every second of the fitting process with David. Looking forward now to playing with my new clubs and hopefully seeing some positive results. A very pleasant experience from the moment I walked in the door. Very welcoming. I feel I have got the right clubs for me, right through the bag. Reading the reviews I knew I was going to enjoy my visit but it was better than I had hoped. From the start the whole thing was top class. David who did the fitting couldn't have been friendlier. He explained everything throughout and answered all my questions as I hit what must have been 15 head and shaft combinations until we found the driver that works for me. He clearly enjoys what he does and the whole process was very enjoyable. When the fitting was done I ordered the club with Don who again was more than happy to talk about all things golf but more importantly for me the first thing he wants to know is if you enjoyed it. A great service from a great family company. If like me you have spent years trying to find the right driver I highly recommend a spin out to ForeGolf. I was really impressed from the minute I walked through the door. David who did the fitting made it very relaxed from the start with no pressure or rushing just excellent feedback all through the fitting. This is a top class facility with my only disappointment being I didn't book it a couple of years earlier. Will definitely recommend Foregolf for anyone playing golf regularly no matter what your handicap. Just had the full bag check with David and walked away very impressed. Great experience from start to finish and I'm looking forward to receiving the goods and getting some rounds in.Could not be happier with the fitting - David created a number of combinations that were getting closer and closer and he was 100% right when he said this should be the one! The difference in feel and ball flight was really significant and has shown me the value of an expert fitting. There was no pressure to purchase but you are given the options and then you decide. I'll be returning when it's time to upgrade the irons. I had a "bag check" session with Dave. It was very good and exactly what I expected and wanted. We went though my longer clubs, Dave adjusted them to get the best out of what I have and let me try different other club options to get the best out of my swing with giving a recommendation of hybrids, wood and driver at the end. The chat with Dave and knowledge he transmitted was also very interesting. Altogether a very good experience. I can only recommend to go and visit them. Not cheap, but worth every cent. First time custom fitting experience. Would recommend to everyone. Had a great time going through the process and learning a lot about my swing. Superb experience at ForeGolf! The hospitality my wife and I received when we arrived was first class. Don & Christine were so welcoming and put us at ease straight from the start. The location and facility is absolutely second to none. The fitting itself was fantastic. I must say Dave was brilliant and did everything he could to find the right clubs to suit me. He was excellent at explaining all the different combinations that he gave me to try and the reasons why we were trying them. There was no such thing as a stupid question and honestly he was an absolute gent to deal with. There was no hard sell on the day. If something wasn't better than what I had, we moved on. Another thing I really appreciated was Dave's attention to detail about where I was going to gain the most from my game, in my case iron play accuracy as opposed to increased length from the tee. I would have no hesitation in recommending foregolf. It was an absolute pleasure. A very personal and professional service provided, I've been to visit twice over the last few years and I can't recommend it highly enough. What I like most about Fore Golf is their honesty and focus on improving a players game rather than making a sale. They will only recommend a club that will help you improve your game rather than interested in getting that easy sale. If the current equipment has is working for you they will tell you that. Booked a custom fitting session with David and was delighted with the whole process. Very personalised service from a true professional and lots of options explored before settling on the right combination of shafts, heads etc to help me improve my game. Never felt rushed from the time I arrived, and was presented with a lovely coffee from Christine followed by a nice chat with Don and Derek before my custom fit with David. Absolutely brilliant experience.As one example, I watched the video of the ball strike pattern on the club face changing from being sprayed all over the club face to being more centred and consistent and wondered if it was set up.for the video. Well, let me tell you, the exact same thing happened to me when I went. I started off by hitting my own 7 iron and then hit some others with little tweaks here and there with different shafts and different weighted heads until the strike pattern became very consistent. OK, it may have been 4mm off centre to the toe and 1mm off center high, but I can live with that.I have ordered my clubs and already have a friend interested in going. Many thanks to Don, Dave and Christine for a super experience at ForeGolf! Beautiful facilities and excellent customer care throughout. Right from the minute you walk in the door, the place has a touch of class. I was excited to get there, get warmed up and get fitted but having never been through the fitting process before, there was some apprehension. I need not have worried, Dave has the patience to match the process, countless combinations tried and tested...and amazing knowledge on show, the numbers don't lie to Dave! I couldn't have been happier...don't think twice, just book in. I had an absolutely brilliant time at my one hour fitting with David. It was apparent early on that he really knew his stuff, and understood what I wanted from my session. After hitting a few shots and creating a good data sample, David handed me a Mizuno iron which looked and felt perfect. I'm absolutely delighted with the clubs, and feel like I can't wait two weeks to get my hands on the full set. Having tried 4-6 driver combinations, David suggested I stick with my own driver - dispelling any pre-conceived notions I had that perhaps it would be an extended sales pitch. Brilliant facility and excellent service - the fitting room itself is like Aladdin's Cave for the golf equipment enthusiast. What a fantastic experience! From the moment you walk through the door you know this place is a bit special. Made to feel completely welcome. David is so knowledgeable and honest. He didn’t try and sell me anything I didn’t need. If what I had did the job it was left alone. I got two hybrids to plug distance gaps and give me a “go to” club off the tee. Highly recommended, if you want to improve your golf and have the assurance that your equipment is fitted to you and your game look no further.Top class in every way. Booked a putter fitting session with David and was delighted with the process! Ran through the various options that I had available to me, going through the numbers on Trackman and explaining the significance of them and then the various ways to try and improve these numbers. I found the fitting to be a great experience to find something that made sure it was an improvement, while also listening to what my preferences, and ultimately the valuable knowledge of why we were changing certain aspects of the club. Overall I couldn't recommend the experience enough and I will certainly be back! I got fitted at ForeGolf just before Christmas, I found the whole experience to be fantastic, the facility is top class from the welcome, to the knowledge and service you get in your session. My Golf has improved so much from my fitting. A+ from start to finish. My experience from the first contact I had through reception with Christine and Derick was very welcoming. The fitting session with David was very constructive and interesting. Immediately I felt confident in his approach. I was comfortable knowing that there were many combinations of brands to choose from. I can highly recommend this fitting service for any golfer. A superb experience. Everything about the fitting is brilliant, from the warm welcome at reception to seeing the amazing workshop and then getting to try a vast array of clubs and shaft combinations. Nothing was rushed, David wanted to ensure I was happy with everything and there was no absolutely no sense that he just wanted to sell something for the sake of it. I was even advised keeping some of my existing equipment as it was performing well. I couldn't fault the session and highly highly recommend visiting. A year or so on from visiting ForeGolf to be fitted for irons my game is in good shape with my handicap coming down to 5 before a hand injury halted my progress. I found the whole experience to be fantastic, a huge combination of shafts and heads ensure that the guys find the right fit for you and when you add in hitting quality balls and Trackman 4 this is real fitting and cant be compared to the high street stores.I am delighted with the MP18's and would highly recommend this experience to anyone serious about getting clubs to enhance their game. I visited ForeGolf in July and had clubs made following a custom fitting session at the facility. In high street retailing, custom fitting really means no more than choosing regular or stiff flex for your brand of choice. ( or the brand of choice the most mark up is on at that particular time!) At ForeGolf, this is a much more individual process. Different club heads can be fitted to different shafts depending on the results of trackman data. The possibilities are endless, but you are finally fitted with a set of clubs made specifically for you. My old set of clubs had 3, 4, and 5 irons that were never used, I couldn’t hit them. After having my clubs made, there are no clubs in the bag that I can’t confidently pull out and swing. I only had my new clubs for the last month of summer rules and I’ve lost 2 shots. I can’t wait for the new golf season again. If you think this is for low handicappers, think again. This was the best golf investment I’ve made in 10 years. Do the fitting and get the clubs built. My only regret is that I didn’t do this 3 or 4 years ago. I first went to ForeGolf in May '17 for a full bag check, and I can only echo the vast majority of comments here by saying it was an excellent experience from start to finish. The benefit of being able to try out various different club and shaft combinations was invaluable. Dave is a real expert, after every couple of balls I hit he made the necessary tweaks, and I ended up with woods and irons that have made a massive difference to my game. Every time he changed something I could see the improvement straight away. Up until the fitting, I just assumed I'd always have a low ball flight. With the clubs they recommended and built for me I now have a strong, high ball flight that has made a massive difference to my game. I finally got to single figures within a year of getting them, after being stuck on 10/11 for 4 years.If anyone is on the fence I couldn't recommend ForeGolf highly enough. The fact they build the clubs to such exacting standards really gives you the piece of mind you're making the right call. Simply put, you'll be a better golfer with the clubs fitted and built here. Really nice welcome from Christine on arrival. The custom fit for my new driver was really enlightening , David sure does knows his stuff. Can't wait to get my new driver .I would recommend the Foregolf experience to anyone. A truly professional and enjoyable experience that any golfer should treat themselves to. From the initial greeting by Christina with coffee/tea on arrival, a quick chat with Don who is the master craftsman that builds the clubs you are made feel very welcome and at ease. Then it's into the swing room with David who expertly will discuss and put together various clubs for you to try out. David will work with you and your swing to create the best combination of club head and shaft to help improve your outcome. A truly fantastic experience and a warm hospitality from a family run business that will have customers returning time after time. Well done to all and thank you. This is the easiest review I’ve made. I love golf. It’s good for my mental health, my confidence and it’s great for exercise. So I want the best of the best when choosing my equipment. I want to be 100% sure I’m getting the best clubs for me. That’s why I go to ForeGolf for all my fittings. If I broke my leg I wouldn’t accept a second rate surgeon. If I had dental issues I wouldn’t accept a second rate dentist. I want the best. That why I go to ForeGolf. I don’t want to worry whether I’ve got the wrong shaft when I’m 5 holes in and I’ve just hooked a drive OB, I’ve other things to concern me. FG take that worry away. It’s really that simple. I have a tested IQ of 142 and I’m the most fastidious person you will meet. I am not wrong. Go to ForeGolf if you need help getting better. PS I have no affiliation whatsoever to this company. Just a happy return customer. Fantastic experience from start to finish.Christine and Don were very welcoming when I first arrived and explained the whole process of what happens during the session.Dave was extremely knowledgeable and helped me select the best driver and shaft for me. He was very welcoming, friendly and really knows his stuff.Would highly recommend Foregolf for anyone looking for custom fit clubs and can’t wait to get back. Thanks for everything!! Excellent experience, that I couldn't recommend more. I found the process hugely beneficial and delivered a major step change in quality of service versus a previous brand fitting I tried. The decision on what clubs to upgrade, and more importantly what not to upgrade, was made easy by the knowledge, data and advice the team at ForeGolf gave. I left the session very confident the clubs & set up recommended was right for me. Cheers guys! Fantastic experience, that I would recommend to anyone that is serious about improving their golf. From the moment I arrived Christine made it a welcoming and friendly environment. The custom fit was very informative and Dave the fitter was extremely knowledgeable and friendly. All in all great value for money and I will be return customer for sure. Can’t wait for my new irons, cheers guys keep up the great work! Great experience. Extremely helpful and friendly and excellent at what they do. Would recommend all golfers of all abilities to go and get fitted. Thanks guys for a absolutely amazing experience. From the moment I entered ForeGolf I was made feel at home, with fresh coffee from Christine and a tour of the clubroom from Don. A big thanks to Dave who is an exceptional club fitter. I'm a fussy individual but his level of professionalism exceeds all standards. He checked everything from choosing the right head and shaft to the correct length, loft, lie angle and grip size as well as a few more little tweaks. He even stayed 20 mins over the time just to get it right. Thanks again Dave. If you enjoy the game of golf you have to visit these guys. Just do it!